Privatization is the shifting of ownership, management or provision of assets and/or services from the public to the private sector. Privatization is first and foremost about guaranteeing profits for companies at the expense of Saskatchewan people. Public-Private Partnerships (P3s) – another term for private ownership or control of community infrastructure and services. 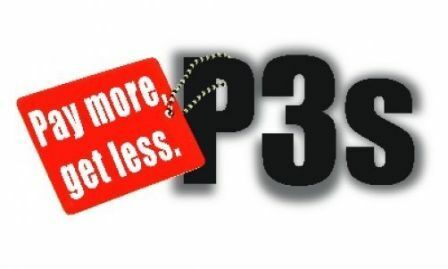 With P3s, governments enter into costly contracts that are essentially rent-to-own schemes rather than building and maintaining community infrastructure directly. Evidence shows that privatization increases costs, and leads to lower quality and a reduction in service levels. We also lose control and accountability with privatization – profit making becomes the sole priority rather than serving the needs of our communities. Handing over control of services and infrastructure to corporations is a political goal of those that stand to profit from privatization and not a real solution to infrastructure and service needs. That’s why we are often bombarded by a heavy duty sales pitch. There is a better way. Saskatchewan people know they can count on public services to make life more affordable and deliver the services we need to improve our communities and our quality of life. Did you know? A Canadian Centre for Policy Alternatives’ 2010 study revealed that an individual Canadian consumes on average $16,952 in public services per year. It’s a benefit that is often overlooked. Despite persistent statements from the Saskatchewan government that it does not harbor a “privatization agenda,” privatization has nevertheless accelerated dramatically under the Saskatchewan Party, particularly during its second and third terms in power. 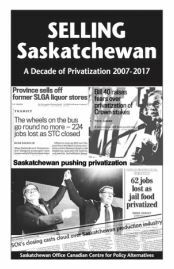 Over the past decade, it is estimated that the Saskatchewan Party government has sold over $1.1 billion in public assets and eliminated at least 1,227 public sector jobs via privatization and outsourcing. Selling Saskatchewan: A Decade of Privatization 2007 – 2017 identifies all the more significant statements and policy decisions involving privatization, public-private partnerships and outsourcing made in Saskatchewan since 2007. The following is a short summary of the privatization that has occurred since 2007 and is not an exhaustive list. 6 government policies were enacted restricting Crown Corporation growth. Outright privatization of health care laundry services in Saskatchewan (closure of public health care laundry facilities in Prince Albert, Weyburn, Yorkton and Moose Jaw announced – over 300 jobs will be lost). P3 announced for new Saskatchewan Hospital in North Battleford. New report confirms privatizing liquor stores will cost Saskatchewan millions in lost funds for public services and communities. Public Private Partnerships—or P3s— is the name given to a method of privatizing services and facilities. In a typical P3 deal, the government pays for-profit private corporations to finance, design, build and/or operate facilities. The government typically commits to lease a P3 facility and use certain services for a period of 30 years or more. P3s are first and foremost about corporations making profit at the expense of taxpayers, and governments are never wise to use them.